Over the last year or so, I have started getting awesome nail designs on my fingernails from the talented Alyssa in Boca Raton (@AlyssaDidMyNails). My good friend, Kristy (@peaceloveandjoy_essentials) turned me on to getting nail designs for summer last year. Summer nails are filled with fresh fruits and bright colors. Below you will find nail designs that are the brainchildren of both me and Kristy with help of Alyssa. They are beautiful and make me smile. Cheer to a fun summer filled with cute nails cheering mimosas by the pool. Summer fruit nails are by far my favorite choice! 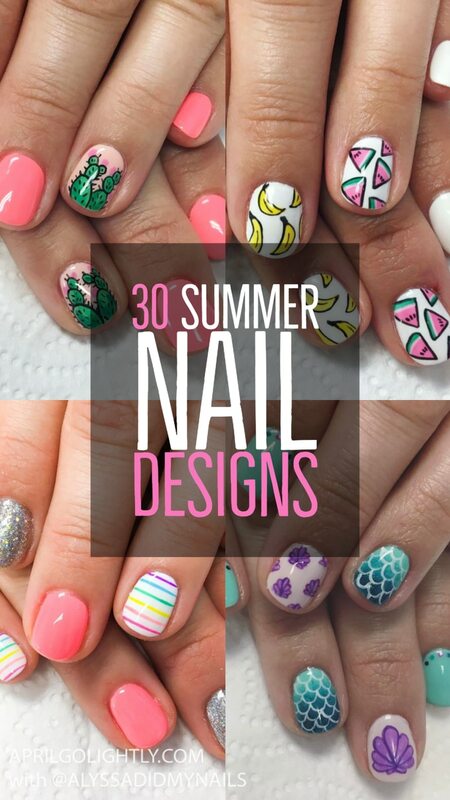 The summer fruits like pineapples, watermelons, and lemons just look so cute as a nail design. If you mix them with palm trees, I am basically in heaven! 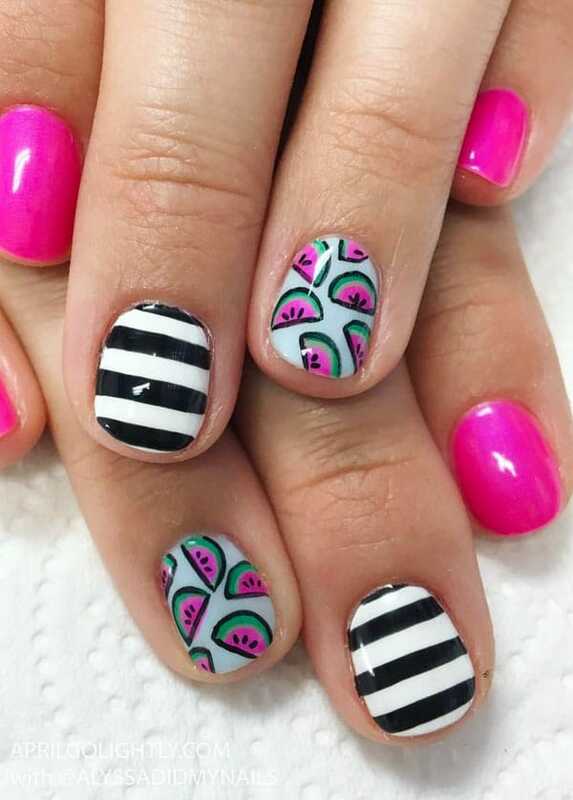 As you can see watermelon nail art is our favorite choice for summer. 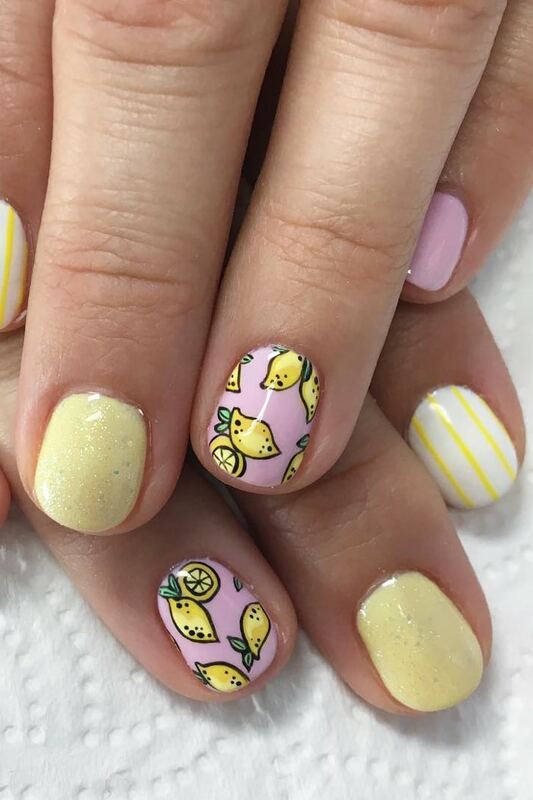 These cute pineapple nails were to match my welcome mat last summer. I brought a picture in and Alyssa made them from the print on my rug. How cools is that? For your next trip to Disney, you can theme your outfits around your favorite Disney Princess like these cute Sleeping Beauty Nails or the Rapunzel Nail Art. If you love all the princesses like I do, you can get a different Princess on each nail. Both Kristy (@peaceloveandjoy_essentials) and I spend a lot of time at Disney World, so we love getting our nails done with a Disney focus. The summer to me growing up means being on the boat. I love a beautiful nautical nail art for patriotic holidays like Memorial Day, Independence Day (4th of July), and Labor Day. How cute are rainbows for summer? In Florida, summer is the rainy season so we see rainbows almost on daily basis during the summertime. Nothing says Florida summer like a rainbow after a quick rainfall. Use your favorite colors to make a chevron pattern on your nails this summer. Here are some really cute ones from Kristy (@peaceloveandjoy_essentials). For my chevron nail art, I decided to go with my favorite colors blush and rose gold. These nails are a perfect neutral look for summer and could be worn all year since this blush tone is so muted. Are you having a summer picnic this year? What about a BBQ? These gingham nails are perfect for a summer picnic outdoors or spending time at BBQ. They look great in red too for 4th of July! These eyelashes and eye nail art seem to be trending this year. I Love the idea of having something so fun and girly on your nails. Summer to mean skip the mascara or use waterproof mascara or even best yet, get eyelash extensions for the summer so you don’t have to deal with mascara. I definitely don’t want extensions all year long, but I would do it in the summer just to skip the mascara in the pool. I digress. These are definitely on my to try list for summer.